You do not need to set up an account to check out. You can complete your order as a “Guest”. However, creating an account has its benefits. Yes, our ordering system is completely secure. We use the industry standard encryption protocol known as Secure Socket Layer (SSL), to keep your order information secure. We guarantee that every transaction you make will be safe and secure. You can verify the security of our ordering system for yourself. In Internet explorer and Netscape browsers, you will see a small image of a padlock in the lower right-hand corner of the browser. In the Firefox and Opera browsers, the padlock image will appear at the end of the address bar. In addition, in all browsers, the web address (URL) will begin “https“. You can also check our third-party verification. This endorsement is checked by independent security-monitoring companies. The Positive SSL Seal endorsement verifies that our secure web pages are, in fact, secure. The Possitive SSL Seal will appear at the bottom of each secure page on our website. You may click on the seal to verify the secure status. Secure Shopping Guarantee: Our Secure Shopping Guarantee protects you every time you shop with us so that you never have to worry about the safety of your credit card information. We use the industry standard encryption protocol known as Secure Socket Layer (SSL), to keep your order information secure. We guarantee that every transaction will be safe and secure. You pay nothing if unauthorized charges are made to your card as a result of shopping with us. Guarantee Details: Under the Fair Credit Billing Act, your bank cannot hold you liable for more than $50 of fraudulent charges. If your bank does hold you liable for any of this $50, we will cover the entire liability for you, up to the full $50. We will cover this liability only if the unauthorized use of your credit card resulted through no fault of your own from purchases made on our site while using our secure servers. Should any unauthorized charges appear on your credit card as a result of shopping with us, you must notify your credit card provider in accordance with its reporting rules and procedures. Most domestic and international orders received Monday-Friday by 3 p.m. (US-EST), will be processed same or next business day. You will receive an email with your tracking information as soon as your order is ready to ship. We can accommodate changes as long as your order has not been shipped. Please understand that our order processing/shipping system has a very quick response time. However, if you need to make a change, please call Customer Support immediately at 1-800-657-5064. Please do not rely on an email request as it may not reach our Sales Department in time. If it is outside of business hours, please call and leave a message. We will do our best to accommodate your change. Domestic Shipping: Available shipping options will be listed before you check out. In general, we ship your order the same day it is received unless is after hours. We will email your tracking information when your order is shipped, so that you can track it online. International Shipping: Available shipping options will be listed before you check out. NOTE: Once orders reach the country of destination, they may be subject to customs clearance procedures that can cause delays beyond delivery estimates. Depending on the country of destination, it is not uncommon for delivery to take up to 4 – 6 weeks. If for any reason you are not satisfied with your purchase, please return the item(s) within 30 days in it’s original packaging and in good condition. Please include a copy of your sales receipt with a note as to why you are retuning the item(s). Ship your item pre-paid to Sulphur Grove Tool LLC, Returns Department. Once item(s) are received in good condition, a full refund for the amount of the item(s) will be issued. Merchandise received after 30 days will have a store credit issued for the amount equal to the item(s) returned*. Returned machinery and / or power tools in proper working order may be subject to a re-stocking fee. If for any reason you need to exchange or return your item, simply call our customer service representative at (904) 619-7935 to receive your return authorization number (RMA). We will give return instructions and the appropriate return address at that time. Depending on the reason for returning the item there could be a restocking fee. If Sulphur Grove Tool shipped and item other than what was ordered we will supply a prepaid shipping label. NOTE: Not all products will be returned to SGTool. Dropped shipped items may need to be returned to the manufacturer. If you decide you do not want an order that has already shipped you can refuse delivery. Once you have refused delivery and the package has been returned to us by the carrier you will be refunded the price of the products shipped less the original shipping fee (or our cost to ship in the case of free shipping) and a 10% restocking fee. If your item was dropped shipped by one of our suppliers you may be subject to a restocking fee as much as 25%. All you need to know is the diameter of the wheel, the width of the tire and the thickness nearest to your OEM tires (3/32″ or 1/8″). We recommend all saws over 14″ use 1/8″ thick tires. However if you prefer, 3/32″ will still be available. If you need thicker, these tires can be installed one over the other. You can also check out our Mfg/Model section. If your saw is listed it will direct you to the correct set. Still need help? Call 1-800-657-5064 or e-mail help@sgtool.com. I know the size I need, but cannot find it on the website. If you can’t find the tires you are looking for on our website, or your tires need additional customization, please contact our Sales Department at 1-800-657-5067. How to install urethane tires. Always unplug your saw while servicing! Unlike the rubber tires that came with your saw, urethane tires are much smaller and have to be stretched on. If you can, it is recommended to remove the wheels for better access and control while installing the tires. After removing the old tires, clean the wheels of debris and adhesive. Some of the smaller tires can be stretched on by hand. If not, you should start by clamping the weld of the tire to the wheel and work the tire on in both directions by adding clamps as you go. You can use a dowel rod or smooth tool to pry the tire on. Once the tire is on the wheel, the stretch will need to be evened out. With a dowel between the tire and the wheel, roll it around the entire wheel. Reassemble your saw. Click here to download a more detailed instruction document for installing urethane tires(PDF). How do I get my band saw to perform better? DISCLAIMER: This checklist is intended only as a guideline for making your band saw perform at it’s best. It is not intended to take the place of the owner’s manual that came with your saw. You should read your owner’s manual and follow the manufacturers’ recommendations. This checklist will give you a track to follow so that you are aware of the different aspects of your band saw. Not all band saws are the same so there may be some differences. You should also be aware that power tools could be dangerous if not operated properly. They can cause severe injury or even death. Review the safety procedures in your owner’s manual. Always unplug the saw and wear eye protection when making adjustments. You may want to wear gloves when removing and installing blades. CAUTION: Coiled blades are under spring-like tension. They can quickly cause damage up to several feet away if uncoiled out of control. Wire ties should be used for storing coiled blades. If a recommendation doesn’t seem correct for your saw, it may not be. Consult your manual or an expert. If something seems unsafe it probably is. Now, let’s tune your band saw! Clean the saw of dust, debris and resin. Just like a car, it will operate better clean. Replace the tires and check the wheel balance. We recommend using urethane tires even if you have new rubber tires from the manufacturer. A lawn mower blade balancing device works good. Rather than adding weight to the light side, you should remove weight from the heavy side by drilling holes in small increments. Reinstall the wheels. Check the alignment to make sure the wheels are coplanar. Shopsmith owners see note below. Inspect your drive-belt and pulleys. We recommend using Power Twist Plus drive belts. Install the blade and bring it up to the correct tension. While rotating the upper wheel, adjust the blade tracking devise so that the blade runs in the center of the tire. Make sure no thrust bearings or guides are touching the blade during this procedure. Adjust the thrust bearings. While rotating the upper wheel, bring the upper thrust bearing forward until it touches the blade and spins. Then back off the bearing until it stops. Repeat this for the lower bearing. The blade should contact both of the bearings at the same time during normal operation. Adjust the blade guides. Blade guides should not touch the blade but be close enough to hold a piece of paper between the guide and blade. They should not be forward enough to cover the blade teeth. We recommend Olson Genuine Cool Blocks. Square the table. Using a square, adjust the table so that it is 90 degrees perpendicular to the blade. Rotate the saw by hand a couple rotations and check that everything runs smoothly. Make sure everything has been tightened. Plug in the saw. Tune the blade using a blade tuning stone. While the saw is running and the tuning stone is held against the table, lightly round the back of the blade to remove any burrs from the blade manufacturing process. You may have to recheck your bearing and guide clearances after this step. NOTE: On Shopsmith band saws, the upper wheel is out of alignment by design. The blade runs on the back of the wheel and then on three bearings. If your blade does not ride towards the back of the wheel it needs adjusted. You do this by placing the palm of your left hand on the top of the wheel and pull or push as needed on the bottom with your right. You have adjusted the wheel enough when the blade rides on all three bearings. Click here to download these instructions for offline reading (PDF). Do I need adhesive? If so, what kind ? By design the tires do not require adhesive. That’s not to say there won’t be a machine every now and then where the tire wants to creep off. In this case, use 3M Super Weatherstrip Adhesive. You can find it in most auto part stores. Similar to the method of equalizing the stretch in your tires is how to apply the adhesive. With a dowel between the tire and wheel, roll it around in short segments applying small amounts of adhesive. No need to wait on it to tack up. Let the tire push out the excess adhesive so that the tire will remain even. You don’t need to glue the entire wheel, just a handful of spots will do. How do I measure and install PowerTwist V-Belts? Lifetime Warranty: Sulphur Grove Tool warranties the tire against manufacturer defects for life. Sulphur Grove Tool will repair or replace the tire for only the cost of shipping. If your tire breaks or begins to separate at the weld, just call for an RMA number and return it to Sulphur Grove Tool. This warranty does not cover misuse, improper saw operation or damage caused by improper installation. Tires must be registered within 30 days of purchase. Click here to register your tires purchased from Sulphur Grove Tool or an authorized Sulphur Grove Tool Distributor. 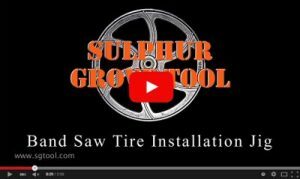 Lifetime Replacement Policy: Sulphur Grove Tool will replace your tires for life for any reason no questions asked at 70% of current list price plus shipping. Just call for an RMA number and return both original tires to Sulphur Grove Tool. Tires must be registered within 30 days of purchase and purchased from Sulphur Grove Tool or an authorized Sulphur Grove Tool Distributor. Please click here to find out about Fenner Drives’ warranty information and procedures. Please click here to find out about Jet’s warranty information and procedures. If you received a defective item please contact our office at 1-800-657-5064. Please click here to find out about Powermatic’s warranty information and procedures. Please click here to find out about Ridge Carbide Tool Co.’s warranty information and procedures. Please click here to find out about RIKON’s warranty information and procedures. Please click here to find out about Shop Fox’s warranty information and procedures. Please click here to find out about The Triton Guarantee. Please click here to find out about True Trac’s warranty information and procedures. Have a question that’s not answered? Please fill out the form below.